CPR, BLS, ACLS, & PALS. The American Heart Association Skills Check is a mandatory in-person test in order to receive any certification after completion of an Online Class. Whether you are trying to become certified in Basic Life Support (BLS for Healthcare Providers), Advanced Cardiac Life Support (ACLS), Pediatric Advanced Life Support (PALS), or HeartSaver CPR AED and First Aid, a Skills Test in Nashville, TN is required after finishing the AHA Online Part of the course. What is a Skills Check? After the successful conclusion of the American Heart Association online portion, in which is taken on your own computer, you must follow up at a AHA Training Site in Nashville in order for a certified instructor to test all the skills in which you have been tested on in the virtual world. This will include assessment of such skills (depending on the type of certification) as how to give a proper chest compression, rescue breathing, Megacode, etc. What if I Didn’t Complete the Online Portion Yet? Schedule A Skills Check Below. This Skills Check is required for completion of a BLS for Healthcare Providers 2 year provider card. You will be given your Certification Card Same Day. Advanced Cardiac Life Support (ACLS) in person tests include the Megacode. You will receive your 2 year American Heart Association provider card after successful completion. Stress-Free Testing!! Pediatric Advanced Life Support skills checks. After completion you will immediately receive your AHA PALS provider card. Stress-Free Testing!! HeartSaver CPR for teachers, trainers, life guards, and anyone who is not a healthcare professional. HeartSaver First Aid / CPR Skills Check. After successful completion of the check by a certified AHA instructor, a 2 year American Heart Association First Aid card will be administered on the day of the test. You will receive an AHA certification card acknowledging the successful completion of all skills associated with this certification. 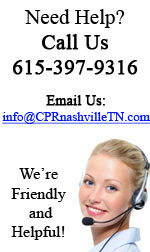 Need a Skills Check in Nashville?